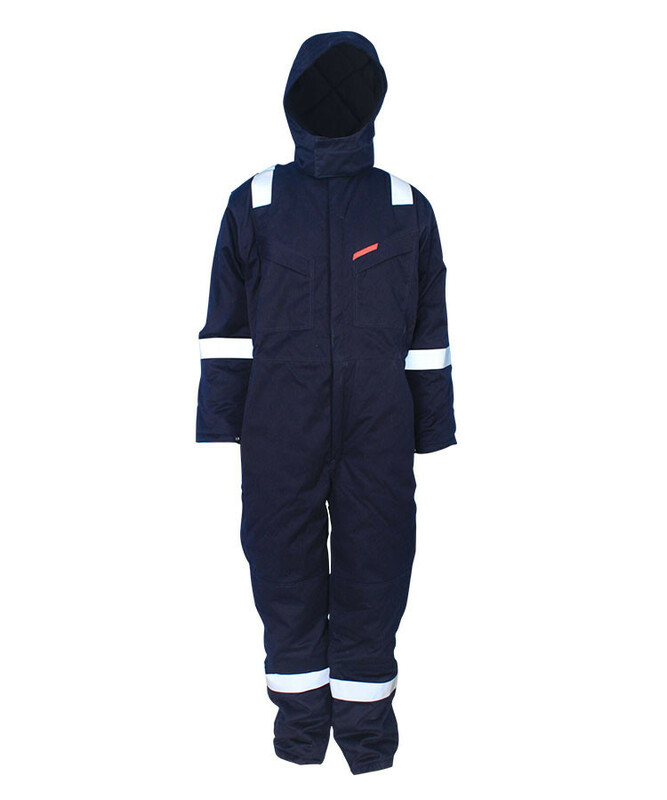 This cotton fire proof coverall made of 260gsm cotton fire proof fabric, and can meet EN ISO 11611, EN ISO 11612, NFPA2112, and other standards. 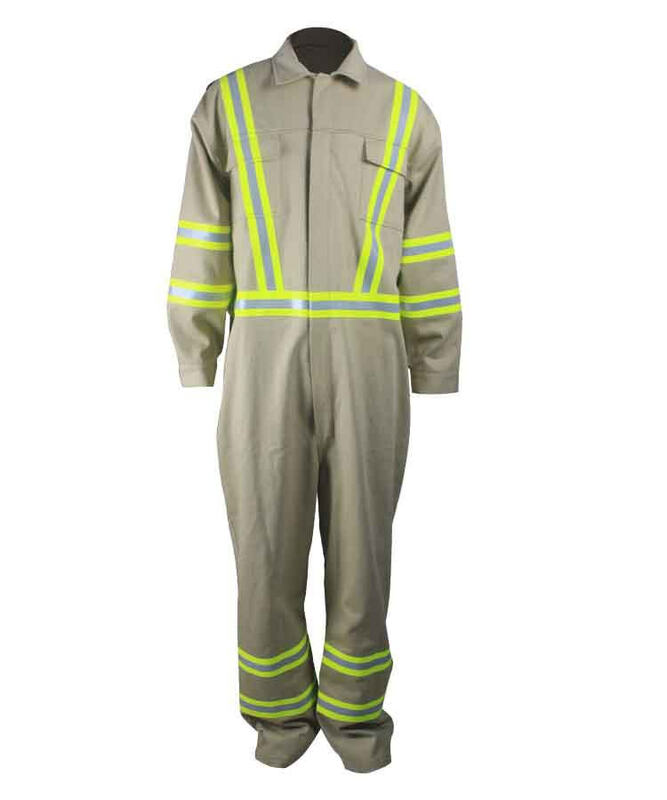 This cotton fire proof coverall has self-extinguishing when leaving the fire, without molten drop, char length can be controlled within 10cm, soft touching, super great strength, super wear resistant property, construction and weave is very tight. The cap is connected with back neck by single opened zipper, easily peel it off. 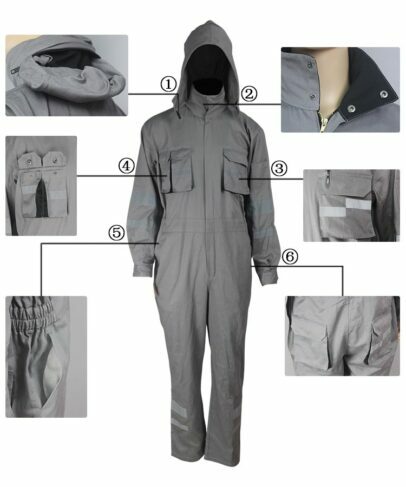 Front opening is closed with hidden metal zipper to neckline, safe and warm. Contrast color three-dimensional pocket with flap on front left chest, closure with snap button. Two little contrast color three-dimensional combination pockets with flap in front right chest, closure with snap button. 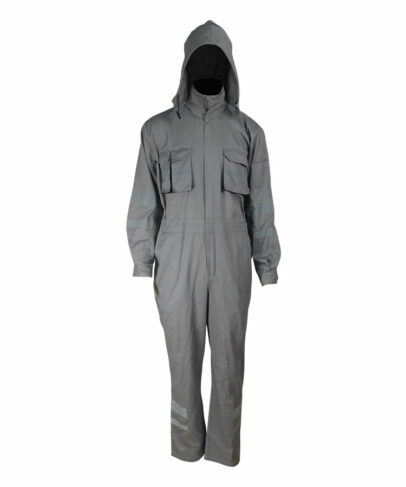 One up and down staggered reflective tape on the cotton fire proof coverall pocket, which shows it lots of structure. 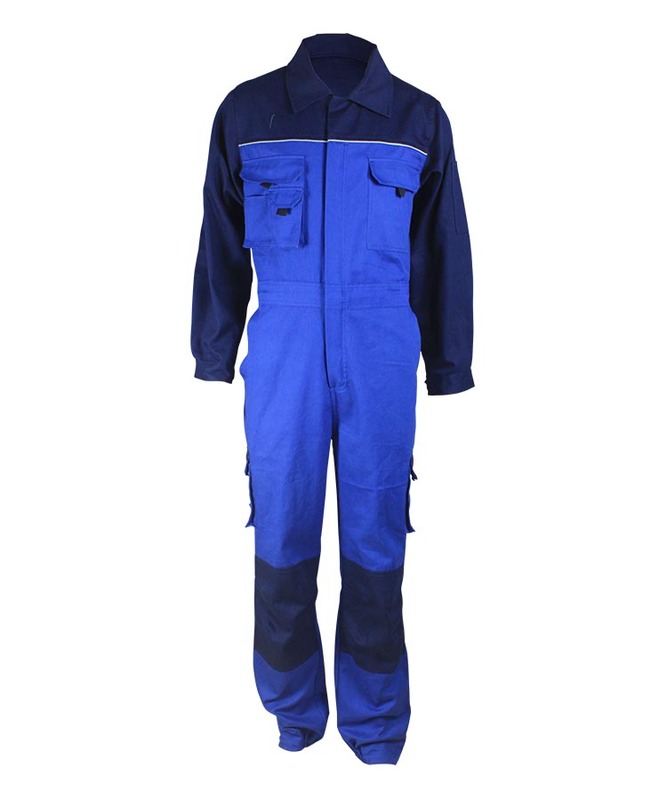 Two slant pockets on cotton fire proof coverall's trousers two sides, waist line connection, add 5cm width waist tape, two side waist with elastic strip to adjust the waist size, suitable for more different size person. 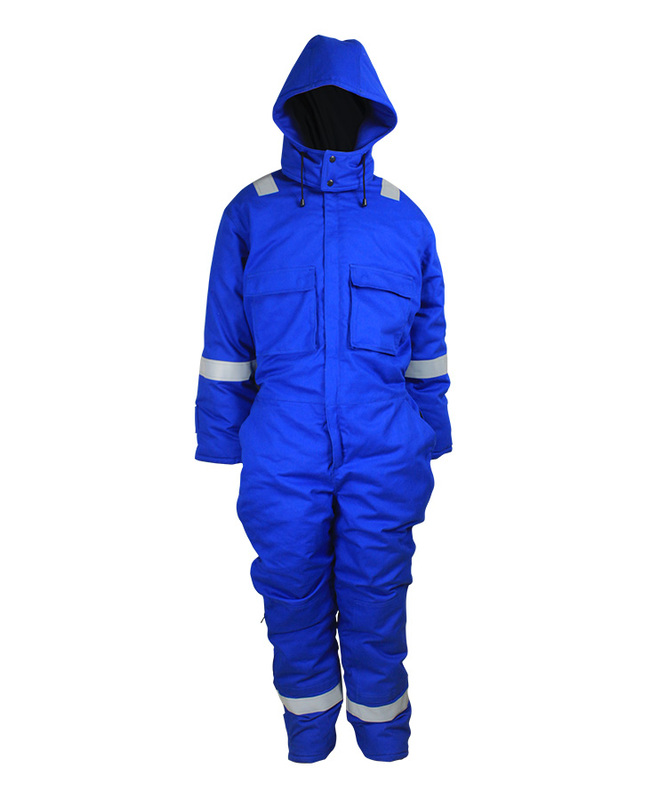 Contrast color three-dimensional pockets with flaps on hip, closure with snap button. 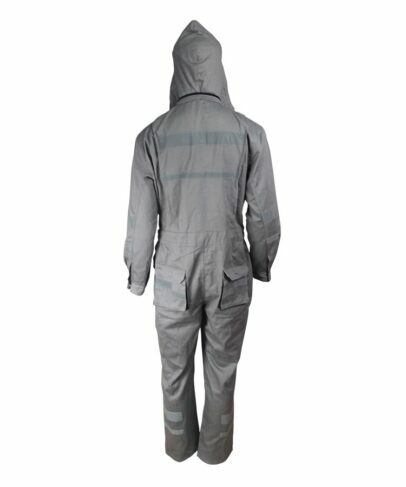 5cm and 2.5cm width reflective tapes on the cotton fire proof coverall back, sleeve and trousers legs, makes the whole cotton fire proof coverall more stratified. Stitched double obvious needles on shoulder, armhole, front rise and back rise, and outside trousers seams to increase firmness. The coat back is active to keep the wearer arm flex. The sleeve is connected by top sleeve and under sleeve, the reflective tape is on top sleeve. The cuff is furcal, and closure with snap button, the cuff size can be adjusted according to wearer’s different requirements, convenient and practical. The nylon rope on cap peak can adjust the cap size. The cap head is closed with Velcro. The cap can be folded and put it into collar, convenient and practical, also increase the thickness of collar, makes it more warm. Bar tack all the force bearing point, increasing the firmness.